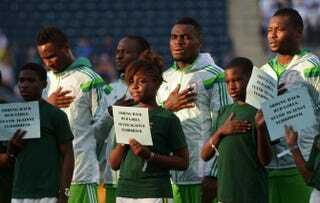 The player escorts for the Nigerian National Team hold signs in support of girls kidnapped earlier in Nigeria, before a game against Greece during an international friendly match at PPL Park on June 3, 2014, in Chester, Pa. Although Nigeria has wrapped up the investigation concerning the kidnapping of more than 200 schoolgirls from Chibok, who are still missing, the militant group reportedly behind it all, Boko Haram, is showing little signs of slowing its reign of terror. According to the New York Times, the Islamic radicals are now under suspicion for new abductions in the northeastern Nigerian village of Kummabza, where 60 girls and women and at least 30 boys have been kidnapped. Nigerian authorities have not confirmed the kidnappings, which are believed to have occurred last week. The Los Angeles Times reports that about 30 people were killed during the latest attack. In April the group kidnapped more than 200 girls from their schools, threatening to sell them into marriage and holding them hostage while demanding the return of some of their detained members. About 57 girls were said to have managed to escape the group before Nigeria declared that it had concluded its investigation. Boko Haram has also been blamed for bomb attacks on Nigerian soccer fans watching FIFA World Cup matches at public venues, the Los Angeles Times notes. As recently as Monday, there was an explosion at a medical school in the northern Nigerian city of Kano that killed eight and wounded 20. According to the L.A. Times, it is unknown if that attack was also part of Boko Haram’s terrorist tactics, geared to creating an Islamic state. Read more at the New York Times and the Los Angeles Times.